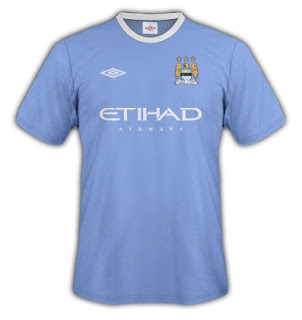 Official Umbro Manchester City FC 09/10 Home Soccer Jersey! Inspired by the club’s rich heritage, the new shirt benefits from Umbro’s football tailoring process: delivering performance and style on and off the pitch. The home jersey combines design elements from the past – like the team’s traditional sky blue and white trim - with new technology, refined detailing and a tailored aesthetic. Each seam on the new crew-neck shirt has been carefully considered and selected for a specific function and the crest has been extensively re-mastered to bring a new level of detail to the club’s identity. The shirt uses Umbro's innovative Climate Control technology, a state-of-the-art fabric, which enhances the movement of moisture away from the body, allowing for increased performance.